Antony Johnson won the Deeping match. 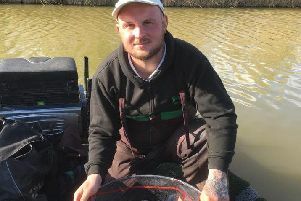 Antony Johnson came out on top when Deeping St James members fished round three of the South Holland Cup on the North View small match lake at Gedney Hill. Drawing an island peg didn’t appear to be an advantage for this match with anglers catching fish all around the lake. Fishing his first club match, Johnson drew peg 15 and used various methods including banded pellet feeder to the island, pellet up in the water at nine metres and then finishing the day off in the margins fishing meat for a total weight of 80lb 6oz. Second was Dave Thorpe on peg 11 with 73lb 4oz and third was Phil Price on peg 12 with 71lb 14oz. There was a time when it was hard to get a ticket to fish the prestigious Ramsey & District Angling Society Hospital Open fished at Ramsey St Mary’s. Unfortunately times have changed and there are very few big attendances on the fenland waters these days. Cup winner was Simon Wagstaff with 5lb 12½oz of small fish taken from peg one on the pole and whip with pinkie over groundbait. Ivan Steels with 5lb 9oz came in second with a net of rudd and skimmers mainly taken on a waggler, followed by Andrew Wilding with 3lb 13oz. In the Saturday Open at Rookery Waters Jimmy Brooks continued his excellent form from peg 38. He started on the Method to catch lots of small carp before alternating between his margin lines for a 140lb 4oz total. Runner-up from peg 13 was Tom Edwards, who fished maggots and groundbait down the edge for 129lb. He was followed by John Cartwright on 117lb 2oz.